For a very long time, pairing a drink with a meal lead to the question of what wine you were going to choose. No one had even considered beer until the last couple of years. Surprisingly enough, beer can be paired with all kinds of foods and is more “food-friendly” than wine. Winemakers don’t have much to play with; they have the grapes and the aging of the wood barrel. On the other hand, Brewers can play around with the barley, hops, yeast, as well as fruit, nuts, vegetables, chocolate and spices. With so many combinations, there is more room for flavour variety when it comes to beer. Tonight, Adelaide Food Central, along with other guests were invited to a James Squire Dinner at La Boca Bar and Grill. The dinner was hosted by La Boca Head Chef, Nicolas Arriola, and James Squire Craft Beer Ambassador, Michael Jackson. We were privileged to sample 4 Argentinian Squires infused courses straight from the asador which were matched with 8 Squires beers. From what we understand, when food is paired with beer, the two either complement each other or oppose each other with contrasting flavours. For example, one might eat a hot curry with a spicy pale ale. Alternatively, a dry, bitter stout can cut through the sweetness of seafood. 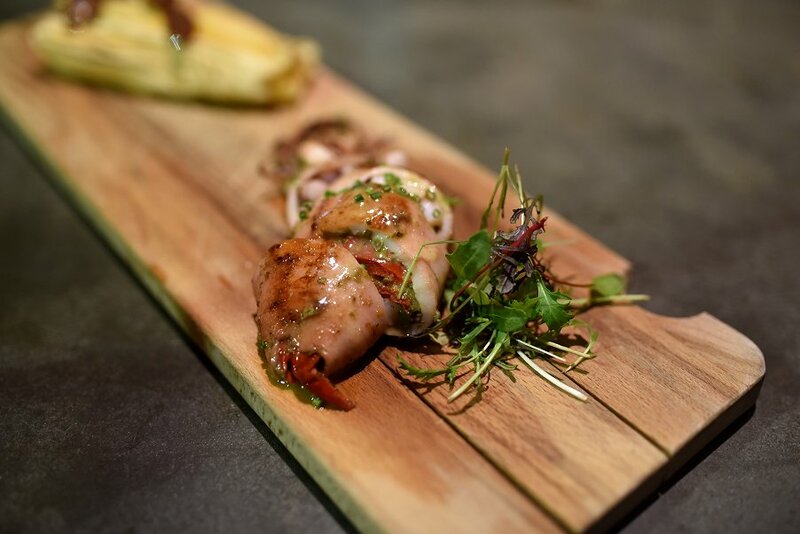 First up was the Chargrilled Squid. The presentation was interesting as the squid legs were stuffed inside its own body. The squid was soft and delicate with lovely smokey flavours. The dish was served with The Swindler Summer Ale which had pear and watermelon characteristics. The contrast in flavours made this pairing work. The Chargrilled Chorizo and Tamales was delicious. 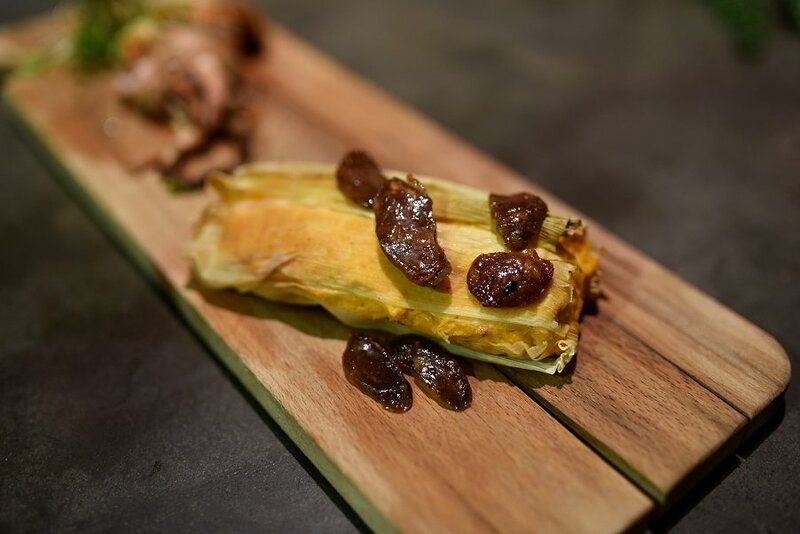 The corn based starchy dough inside the corn husk was soft and creamy with a lovely natural sweetness. The crunchy slices of chorizo provided a contrast in texture. This dish was complemented by The Nine Tales Amber Ale which had a malty sweetness and nutty finish. 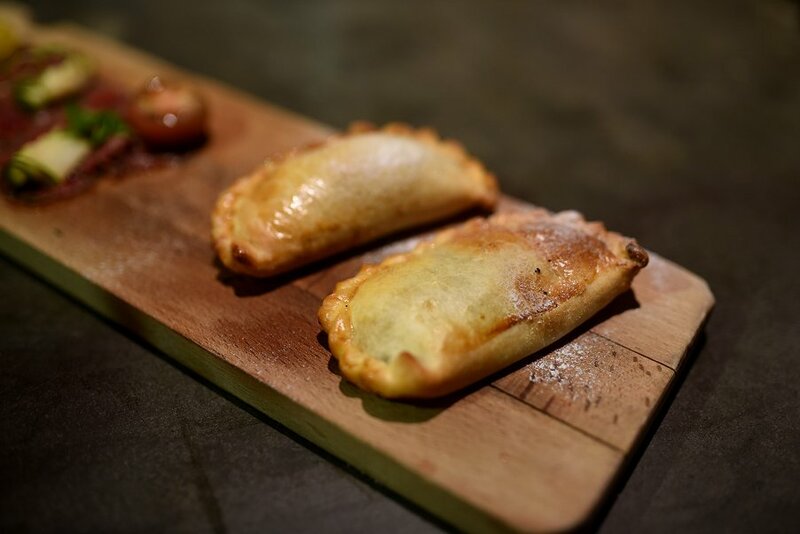 The Lamb Empanada was the best we’ve ever had. Inside the firm but delicate pastry were lean morsels of lamb drowning in a rich, well seasoned gravy. Every bite was just as good as the last, and you couldn’t help wanting more. This dish was matched with Rogers Beer and provided a flavour contrast with its notes of citrus and light bready flavour. 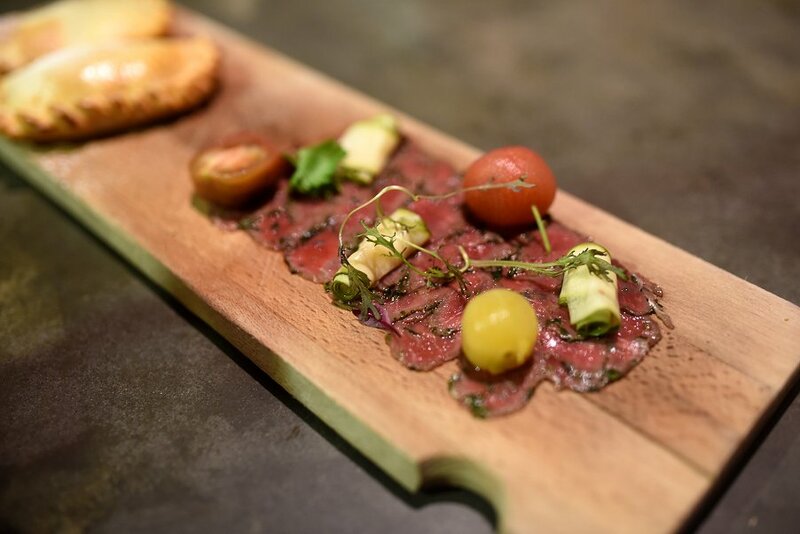 The Lamb Carpaccio had a silky smooth texture and you could taste the sweetness from the cherry tomatoes, apple and grapes. This was well complemented by the Hop Thief 8 American Pale Ale which had distinct characteristics of citrus and passionfruit. 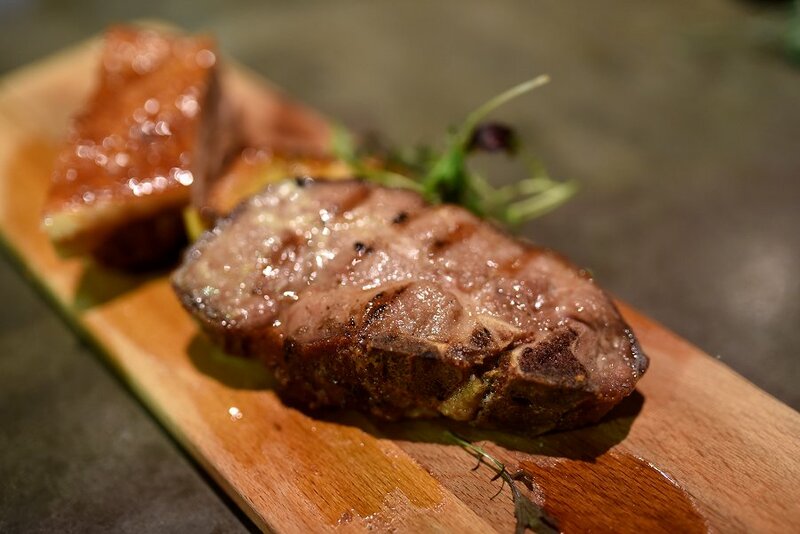 We don’t think we’ve ever had a Pork Rib-eye before, but there’s always a first for everything. 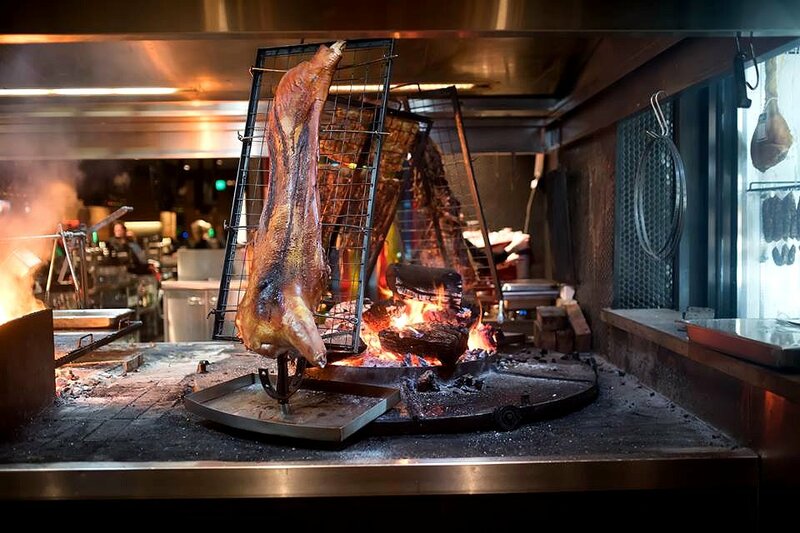 This particular cut of meat was dry aged in house and then cooked on the parrilla. There was a distinct marbling of fat throughout the meat and you could taste the smokey flavours with each bite. Served with a roasted apple, it was a tried and true combination. The Little Creatures IPA that the dish was served with had characteristics of grapefruit and marmalade. The beverage essentially mimicked the sweetness of the apple and was a good pairing. We’ve seen Pork Belly cooked wrong so many times we’re often a bit disheartened. Gladly we can report that this Pork Belly was perfect. The meat was tender and succulent, the skin had the right amount of crunchiness. 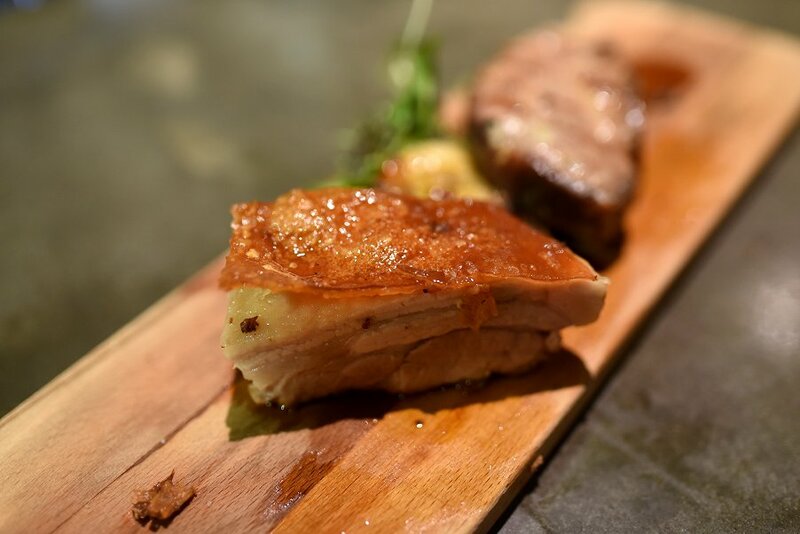 Food lovers know that pork and apple go hand in hand, so it was no surprise this dish was paired with the Orchard Crush Cider. This cider isn’t as sweet as normal ciders but it was tart, and the taste was like chewing into an apple. 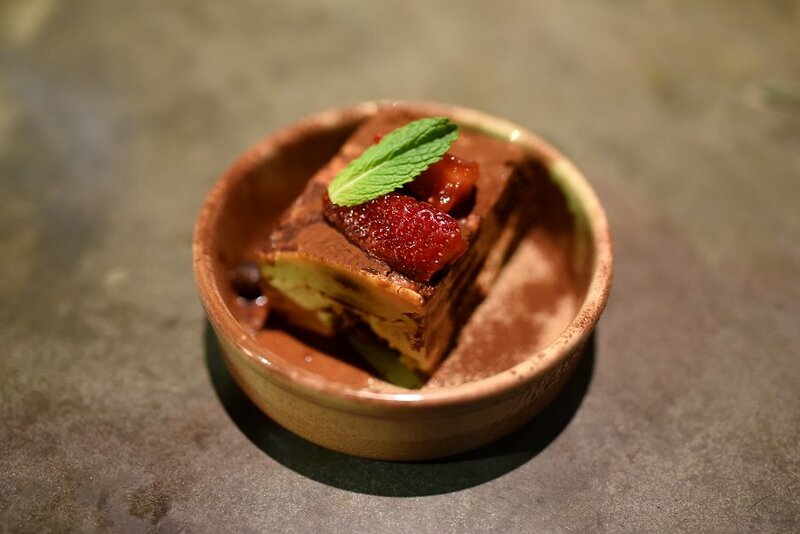 As we always say, no meal is complete without dessert. The Chocolate, Coffee and Caramel cake was simply amazing. The texture was a combination of spongy and gooey with that hint of coffee. It rich, decadent and delicious! The chocolate and coffee characteristics of the Jack of Spades Porter really complemented this dessert, while the smokey flavours of the Southwark Stout played more of a contrasting role. What an amazing evening of food and beer pairing! 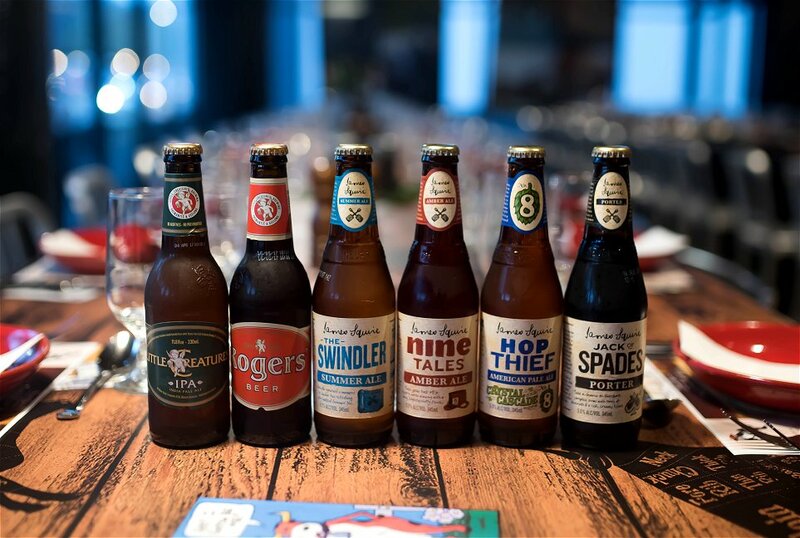 The master in the kitchen, Chef Nicolas, came up with the most delicious and exquisite dishes that were matched perfectly with the James Squire beers. It goes to show that with so much flavour variety in beer, the task of matching it with food is a more simpler process than it is with wine. Adelaide Food Central would like to thank Chef Nicolas and the La Boca staff for their hospitality, and Michael Jackson from James Squire for the matching beers.